He was born Francis Nicholls in The Bronx, New York; he later moved to Chicago. He played an important role in developing and popularizing House Music in Chicago during the 1980s when the genre was in its infancy. Due to his importance in the development of the genre, Knuckles was often known as “The Godfather of House Music” and as such the city of Chicago named a stretch of street and a day after Knuckles in 2004. His accomplishments earned him a Grammy Award in 1997. Knuckles was inducted into the Dance Music Hall of Fame in 2005 as recognition for his achievements. While studying textile design at FIT in New York, Knuckles began working as a DJ, playing soul, disco, and R&B at The Continental Baths with childhood friend and fellow DJ Larry Levan. In the late 1970s, Knuckles moved from New York City to Chicago, and when the Warehouse club opened in Chicago in 1977, he was invited to play on a regular basis. He continued DJing at the Warehouse until 1982, when he started his own club in Chicago, The Power Plant. DJ History reports: “The style of music now known as house was so named after a shortened version of [Knuckles’ Warehouse] club. Knuckles bought his first drum machine from Derrick May, who regularly made the trip from Detroit to see Knuckles at the Warehouse and Ron Hardy at the Music Box, both in Chicago. Knuckles also had a musical partnership with Chicago artist Jamie Principle, and helped put “Your Love” and “Baby Wants to Ride” out on vinyl after these tunes had been regulars on his reel-to-reel player at the Warehouse for a year. As House Music was developing in Chicago, producer Chip E. took Knuckles under his tutelage and produced Knuckles’ first recording, “You Can’t Hide from Yourself”. Then came more production work, including Jamie Principle’s “Baby Wants to Ride”, and later “Tears” with Robert Owens (of Fingers, Inc.) and (Knuckles’ protégé and future Def Mix associate) Satoshi Tomiie. When the Power Plant closed in 1987, Knuckles played for four months at Delirium in the United Kingdom. Chicago House Music artists were in high demand and having major success in the UK with this new genre of music. Knuckles also had a stint in New York, where he continued to immerse himself in producing, remixing, and recording. Knuckles made numerous popular Def Classic Mixes with John Poppo as sound engineer, and Knuckles partnered with David Morales on Def Mix Productions. His debut album Beyond the Mix (1991), released on Virgin Records, contained “seminal work”, “The Whistle Song”. The Def Classic mix of Lisa Stansfield’s “Change”, released in the same year, also featured the whistle-like motif. Another track from the album, “Rain Falls”, featured vocals from Lisa Michaelis. Eight thousand copies of the album had sold by 2004. Other key remixes from this time include his rework of the Electribe 101 anthem “Talking With Myself” and Alison Limerick’s “Where Love Lives”. When Junior Vasquez took a sabbatical from The Sound Factory in Manhattan, Knuckles took over and launched a successful run as resident DJ. Knuckles continued to work as a remixer through the 1990s and into the next decade, reworking tracks from Michael Jackson, Luther Vandross, Diana Ross, Eternal and Toni Braxton. He released several new singles, including “Keep on Movin'” and a re-issue of an earlier hit “Bac N Da Day” with Definity Records. In 1995, he released his second album titled Welcome to the Real World. By 2004, 13,000 copies had sold. In 2004, Knuckles released a 13-track album of original material – his first in over a decade – titled A New Reality. In October 2004, “Your Love” appeared in the videogame Grand Theft Auto: San Andreas, playing on house music radio station, SF-UR. In 1997, Knuckles won the the Grammy Award for Remixer of the Year, Non-Classical. In 2004, the city of Chicago – which “became notorious in the dance community around the world for passing the so-called ‘anti-rave ordinance’ in 2000 that made property owners, promoters and deejays subject to $10,000 fines for being involved in an unlicensed dance party” – named a stretch of street in Chicago after Knuckles, where the old Warehouse once stood, on Jefferson Street between Jackson Boulevard and Madison Street. 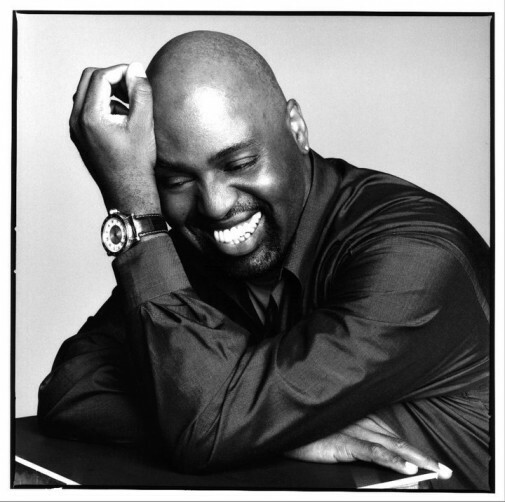 That stretch of street, called Frankie Knuckles Way, “was renamed when the city declared 25 August 2004 as Frankie Knuckles Day. The Illiniois state senator who helped make it happen was Barack Obama.” In 2005, Knuckles was inducted into the Dance Music Hall of Fame for his achievements. Knuckles was featured in the documentary films Maestro (2003), written and directed by Josell Ramos, and The UnUsual Suspects: Once Upon a Time in House Music (2005), directed by Chip E.
October 2004, “Your Love” appeared in the videogame Grand Theft Auto: San Andreas, playing on house music radio station, SF-UR. Knuckles died of Type II diabetes-related complications in Chicago on March 31, 2014 at age 59. Knuckles had developed that disease in the mid-2000s. DJ Magazine reports: “House music fans have already been buying copies of Frankie’s ‘Your Love’ in an attempt to get it to the top of various charts as a tribute to the great man.” Jet commented that his death meant a “sad day for music fans” and promoted Knuckles’ “Your Love” track.